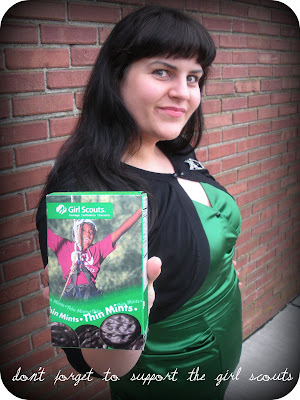 I spent many years in Girl Scouts. I sold many many boxes of cookies. I have awards to prove it (hidden away in my Mommy's basement). I wonder if I were standing out in front of the grocery store if I could sell any now. To me there are few things better than a box of thin mints and little girls getting all excited about making another sale. Oh, how I remember that feeling. BUY SOME GIRL SCOUT COOKIES. IT MAKES LITTLE GIRLS HAPPY. p.s. Have i mentioned that I hope to have a little girl one day and a Girl Scout troop. Love that colour green on you.x. thin mints are my all-time favorite. cannot believe it's march already. and you do look simply fabulous in your cyd charisse dress! Thin mints, yum. The other one I like has carmel in it. What is that again? Yep, those were busy days with you Girl Scouts selling cookies. One year you got a plaque for selling so many cookies. Julie has to be the all time best Girl Scout leader........with her as the leader, fun was inevitable.